Pluto moves very slowly through the Zodiac taking anything between 10 and 30 years to go through a particular sign. Its passage through a sign presages changes for a whole generation. Pluto was in Libra from 1971 to 1983 and this was a period of major changes in the relative roles of men and women. Libra is a sign of relationship and this period saw significant advances in the feminist movement. The first female political leaders came to power with Pluto in this sign and Margaret Thatcher had the planet conjunct her Libran Sun when elected in 1979. Before Pluto appeared in Libra men’s and women’s roles in society had been fairly polarised and the fashionable attitude towards masculinity and femininity reflected this. From 1971 fashions changed to a much more androgynous, gender bending image and as always the music industry was the pioneer in terms of fashion and the early 70s saw an explosion of what is now called Glam Rock. Of course long hair had been around for some years now but it was more the scruffy hippy long hair and with beard look. At the start of the 70s male artists were experimenting with make up and the pioneer of this look was Marc Bolan. If you wanted to create an astrologically perfect fantasy image of one of the beautiful people you could do you no better than the Sun, Venus and Neptune conjunct in Libra. Bolan has this conjunction right on his Midheaven so his career would be the focus for this picture. All three planets are opposite the Moon in Aries and if ever a planetary placing symbolised the classic rock star theme of starring brightly and briefly but then burning up it’s this one. The Moon in Aries creates a lot of excitement but soon runs out of steam. Marc Bolan’s breakthrough was with the single Ride a White Swan. This image captures the central opposition of his chart so well. A white swan is one of the most beautiful and graceful animals, but it can turn nasty and bite you as anyone who ever tried to ride one would testify. Bolan’s time on centre stage was extremely bright but also very short as he was killed in a car crash before his 30th birthday. The eighth house is traditionally associated with death and Bolan had a very difficult combination of Mars, Saturn and Pluto there. Mars is the principle of drive, Saturn is limitation and restriction and Pluto is sudden drastic unexpected change and is also the planet of death and rebirth so all three together in the eighth house does seem to convey the idea of being killed in a car crash. Mark Bolan’s sudden emergence onto the scene with Ride a White Swan coincided with Pluto arriving at his Midheaven in 1971. This was followed by a string of number one hits over the next couple of years. In 1972 T. Rex, Bolan’s band accounted for 6% of all record sales in the UK. With the Midheaven ,Sun and Moon positions so close together it would be hard to separate each one and they would have to be treated together. However by the end of 1973 the fame had started to fade. Pluto arrived at Bolan’s Sun towards the end of 73 through to 1975 and,this period corresponded with his desire to change his music to create richer, more complex and experimental music forms. The original T. Rex disintegrated in 1974 to 5. Pluto moved to oppose the Moon from 1974 to 6 . 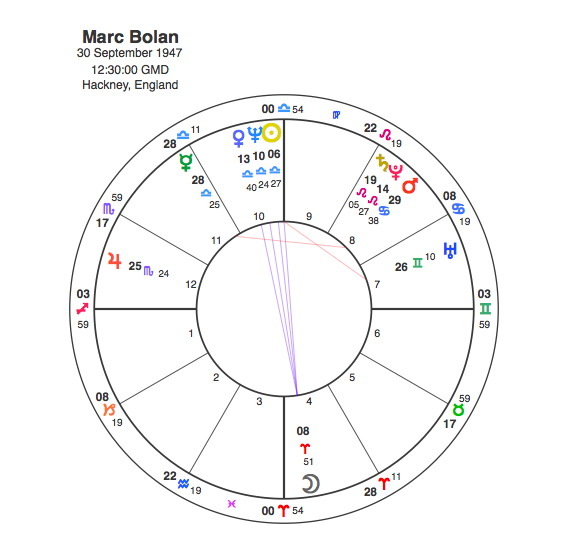 Bolan’s marriage broke up and his son Rolan was born as a result of his affair with Gloria Jones in September 1975, a classic Pluto opposite Moon development. Pluto was also conjunct Neptune from 75 to 76 and Venus from 76 to 78. The dissolving and disintegrating effects of Neptune’s 10th house placing on his career were clearly in evidence at this point and the last conjunction Pluto made to his Libra group of planets coincided with the car crash that killed him. The classic rockstar vision of the great excitement of youth was summed up by The Who’s famous line, ” I hope I die before I get old. ” Thanks to the intensity of Marc Bolan’s Libra / Aries opposition and some help from Pluto this would never be a concern for him. Marc Bolan was one of the great early pioneers of the Pluto in Libra generation.